1 Combine ground beef, 4 tablespoons Hellmann's® Organic Original, bread crumbs and gochujang in large bowl; shape into 4 patties. Grill or broil until done. 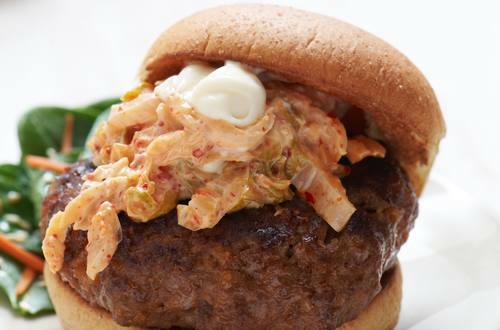 2 To make slaw, combine remaining 1 tablespoon Hellmann's® Organic Original, kimchi and honey in medium bowl. 3 Arrange burgers on bun bottoms, then top with slaw, a dollop of remaining Hellmann's® or Best Foods Organic Original Mayonnaise and bun tops.